It is DYNAMITE! Bold and tenacious in character, the sharp bite of shellfish is the main theme. Top notes of oyster, clams, & sardines provide for stable and compelling undertones of extracts, emulsions and oils. It all rides together to cut the cold night air like a razor knife. 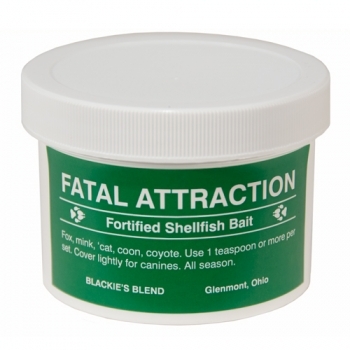 This bait is the absolute best there is for cold weather raccoon that will not go for lesser baits. It's an excellent bear attractant as well.